eBusiness was created for those looking to use WordPress as a CMS. eBusiness uses a Page-Based layout, however, a normal Blog-Style mode is also available. eBusiness is great for business or personal bloggers looking to use WordPress to take their website to the next level. It comes equipped with an in-depth options page that gives you increased control over your blog, as well as 3 unique skins and a total of 9 color variations to help insure that anyone can customize the theme to suit their needs. eBusiness comes with three different skins, and each skin with three different color schemes. For more info refer to the slider and preview links above. Even though eBusiness was created to be a CMS with a Page-Based structure, you can also run to the theme like a normal blog instead. This theme utilizes timthumb to automatically resize your thumbnail images. Because of this, only one thumbnail images is required per post, despite the various thumbnail sizes used in the theme. With eBusiness you can place 125×125 banner images in your sidebar and 468×60 ads to your post pages with ease. Advertisements are handled from within wp-admin, and can be turned on and off at any time. Coldstone offers a unique blend of grungy and professional elements. 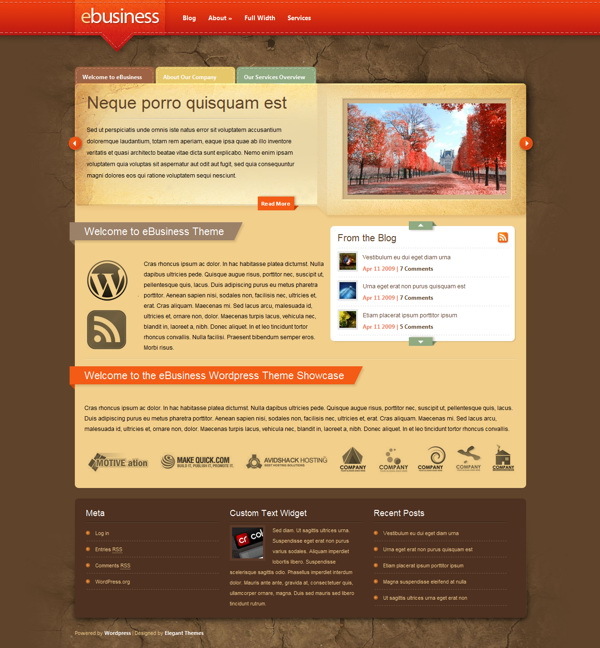 The theme comes with three unique homepage formats, including Business Style, Blog Style, and Magazine Style, and a robust options menu that makes managing ColdStone fast and easy. Coldstone contains three unique post layouts. The default (Business), as well as Blog-style (which displays full-length posts) and Magazine-style (which displays the main sidebar on the homepage, and contains additional post/thumbnail variations). Coldstone contains three widget-ready areas. The Business-style homepage has it’s own unique sidebar, and the footer is also widget ready. This theme utilizes timthumb to automatically resize your thumbnail images. Because of this, only one thumbnail images is required per post, despite the various thumbnail sizes used in the theme. With coldstone you can place 125×125 banner images in your sidebar and 468×60 ads to your post pages with ease. Advertisements are handled from within wp-admin, and can be turned on and off at any time.